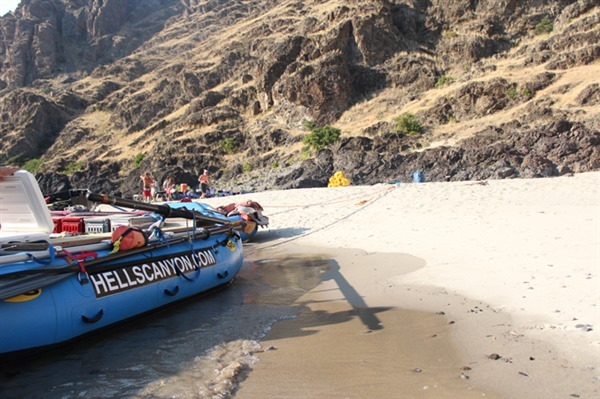 Raft and relax on pristine sandy beaches during your 5 or 6-Day Salmon River Whitewater Rafting Trip! There are so many ways to enjoy the sights. 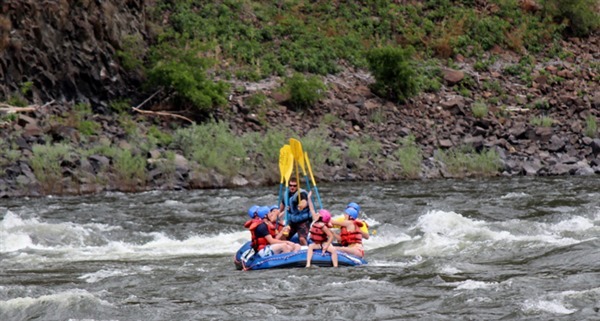 Our Salmon River trips are great for families or large groups. Even kids love coming out to spend time on the river! 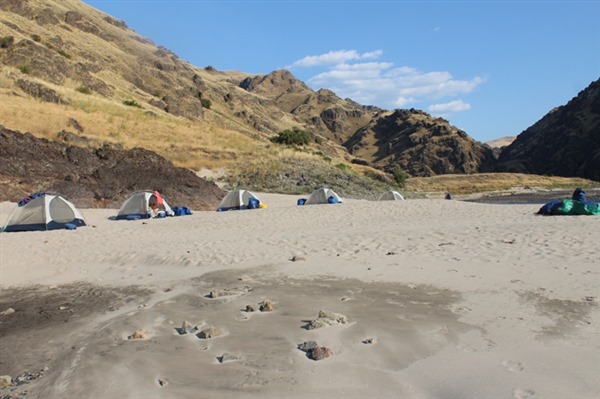 Our Salmon River camp sites are set on beautiful white sandy beaches nestled among the massive canyon walls. Quiet river pools provide perfect swimming holes to cool off on a hot summer day. 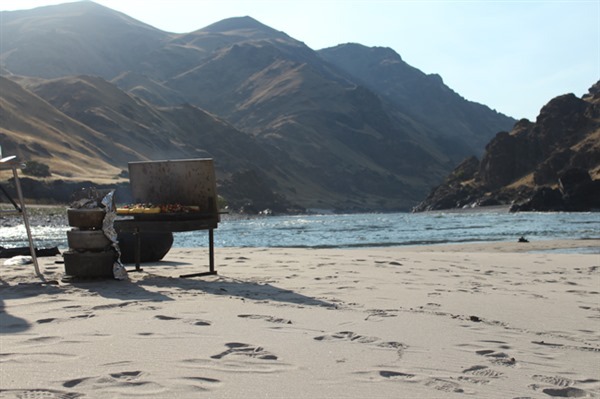 There’s plenty of time to enjoy a game of beach bocce ball or a hike among numerous ancient Indian petroglyphs while our guides prepare a delicious three course meal. 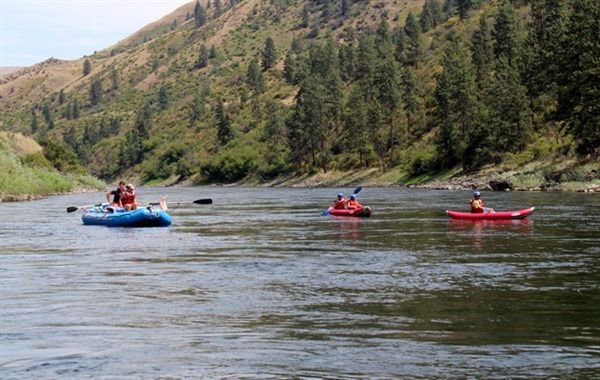 Relaxing beneath the glistening Idaho sky and roasting marshmallows are the perfect ways to end a peaceful and exciting day on the Salmon River. 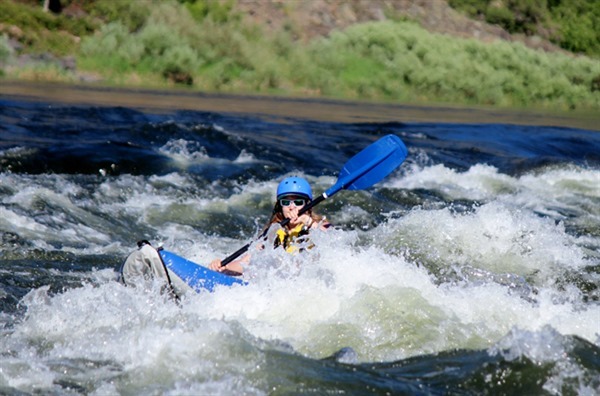 Our Salmon River trips are rated EASY and considered appropriate for any physical ability, including children ages 7 and up. Most physical activities are optional. The trip may require walking on uneven terrain for short distances. 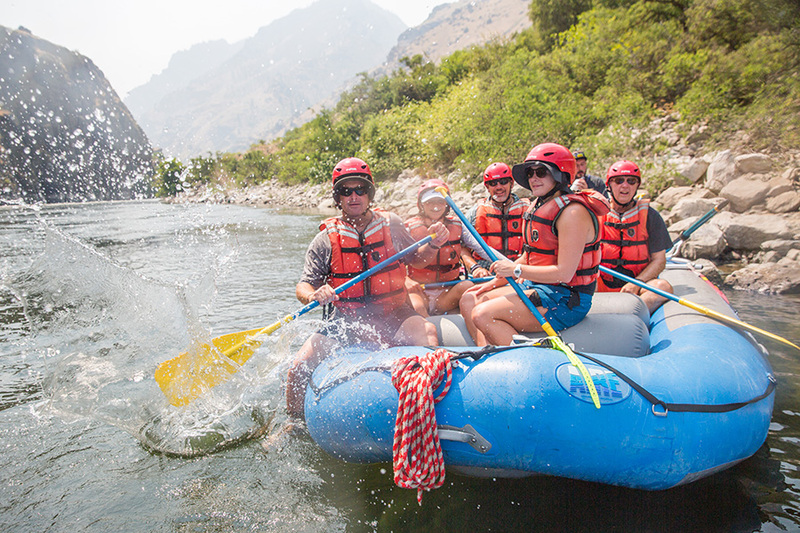 From relaxing on the beaches to hiking steep terrain, the choice is yours on how to enjoy the Salmon River in a way that suits you best. The Salmon River has Class II, III & IV whitewater rapids: mostly Class III’s with a few Class IV’s. It is a big volume, drop pool river. While most rapids are not technically difficult, they’re a lot of fun with a big ride and big waves. Stay prepared during your 5 or 6-day Salmon River trip. It is usually hot and dry in the summer. Average highs are in the 90’s with some weeks exceeding 100F. The nights usually cool off with average lows in 60’s to 70’s. Bathing suits, quick dry shorts/pants, and long/short sleeve shirts are recommended for the day. Although cotton is not usually recommended on most river trips, it is appropriate and cooling during the hot days. A light rain jacket is useful for the off chance of rain or splashy rapids, especially in the early mornings or late afternoons. Protection from the sun is highly recommended. Sun hats, sun glasses, sunscreen, and long and light layers are excellent. While in the raft or kayak you should wear sturdy shoes that will stay on your feet and should be comfortable when wet. There are many appropriate varieties of boat shoes: Teva’s, Chaco’s, Keen’s, Aqua Socks, or even old tennis shoes (although they will get wet and stay wet for the whole trip) are a few options. Flip flops are not appropriate in the boats. Packing another pair of shoes specifically for camp is highly recommended. These could be flip flops, sneakers, hiking shoes/boots or galoshes. Pick shoes that will be comfortable and match your level of activity. A separate outfit for camp is also advisable. A large waterproof overnight bag is supplied per guest for clothing, sleeping gear, toiletries, etc. It can easily fit one sleeping bag and the contents of a good-sized duffle bag. This bag will be packed away during the day and should contain only items that you will need at camp. A smaller waterproof day bag will also be provided and will stay with you on the boat. It is accessible throughout the day and can contain items such as sunscreen, a warm fleece or rain jacket, chap-stick, and/or a camera. If packed and sealed correctly, your bags will stay dry under most conditions. ARC guides will help to ensure that they are sealed properly. In order to protect important items (such as cameras, medications, etc. ), it is a good idea to pack them in zip-lock bags inside your dry bag. If you are planning on bringing an expensive camera, please let us know and we should be able to provide a waterproof box that will be accessible throughout the trip. Call the office for more information about properly storing and packing important items. We are happy to help. The Salmon River features excellent fishing. You’ll be able to fish from the boats throughout the day, from the bank during lunch, and in the evenings at camp. You will need to obtain a valid Idaho fishing license.